Alexis Gerard Finger is the author of a text that is a major contribution to any English through drama teacher's library. It is called, THE MAGIC OF DRAMA and it is published by FULL BLAST Productions, Box 408, Virgil, Ontario, Canada. Please send for a copy today. The pages are reproducible and a teacher really needs no other resource to guide him/her through years of stimulating classroom activity. Here is what Alexis says in her preface: "The text begins with relatively stress-free pair and group impromptu conversation and discussion activities that provide students with occasions for 'thinking on their feet' with no formal audience to worry about. Gradually, the activities become more challenging as students engage in debates, improvisations and rehearsed scenes that are performed for the class. Finally, students write and perform original material for an audience of classmates and, if desired, invited guests." Elsewhere, she points out that "You do not have to be a professional chef to prepare and enjoy a good meal" and that her book is a kind of communication book of recipes. Well said. And, it is. 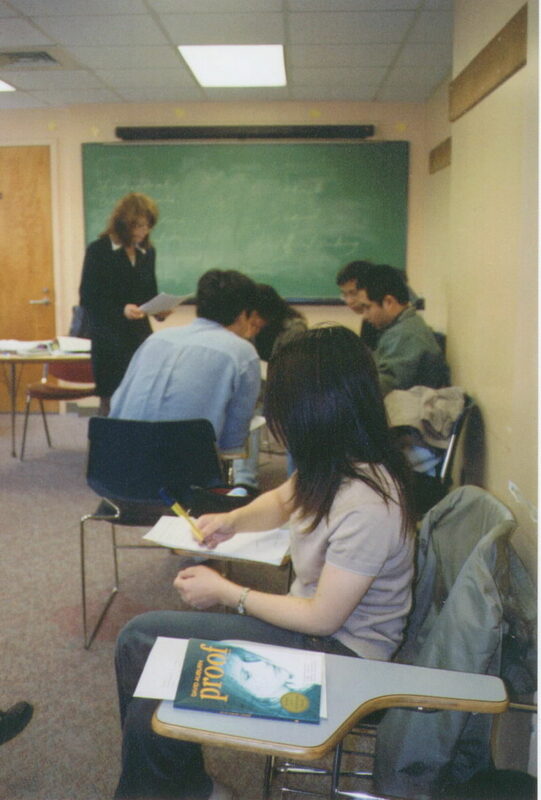 The English Language Center at Drexel University prepares students for academic life at the university. Consequently the students in Alexis's classes are intermediate or advanced students who are academically oriented. 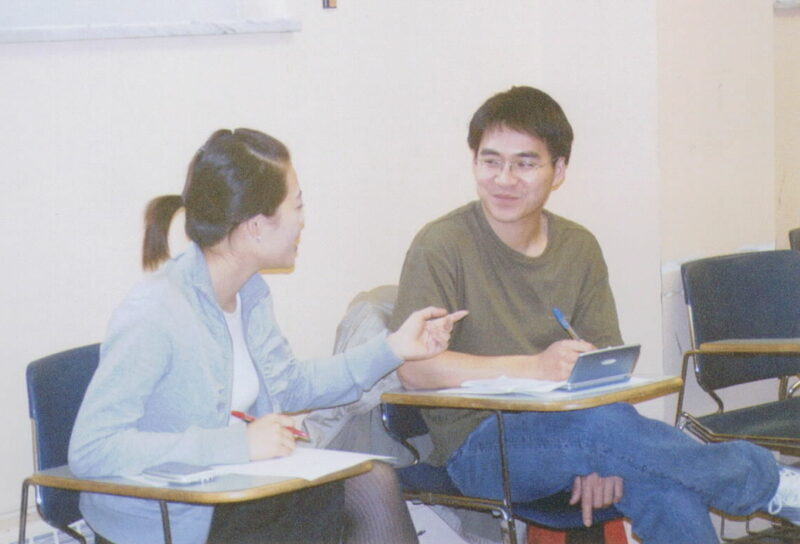 They are either in the Intensive English Language Program or foreign graduate students looking to improve their communication skills. The class I saw was comprised of the latter. Alexis explained that the class is offered free of charge and can be repeated as often as a student desires. It meets for four hours every week and bears no credit. This situation would seem to be the perfect basis for a language class because it reduces the pressure on students to perform for grades, but puts the emphasis squarely on enjoyment of clear communication. No wonder drama is placed in the middle of it. No wonder many students repeat the course several times! The students had just finished working on The Birdcage and had performed that the previous week in class. This week, they had read Proof and had gone to see a performance of it at a local professional theater. They had discussed the play in the previous class and had developed an understtanding of the characters and plot line before going to see the production, Now, they were coming to class prepared to diiscuss the production and do some role plays. by noting that sometimes they couldn't see body language and facial expressions because of the positioning of actors on the thrust stage. Then there was an appraisal of the various performers and their performances. Obviously, the students had come to understand stage and acting terminology and theatrical expectatons. 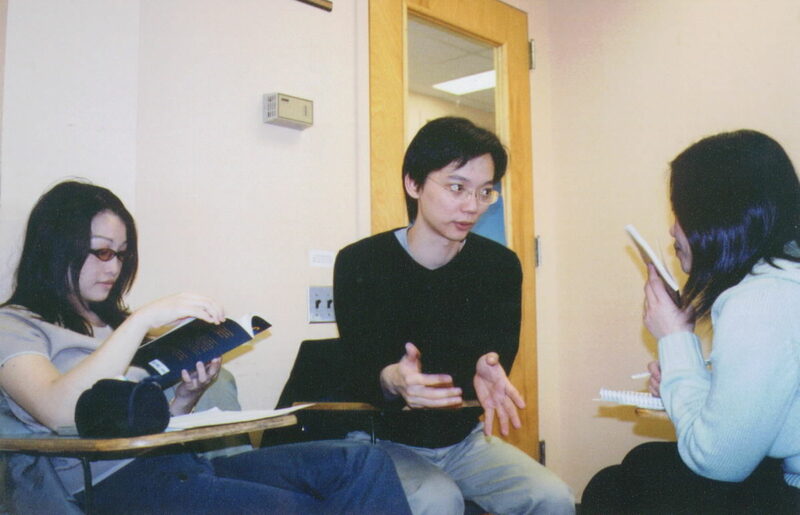 This part of the discussion revealed that they could converse on relatively sophistciated subjects with insight and perception and, the most important thing for a language class, articulate their ideas about the production in English. After introducing the general discussion of the performance, Alexis changed the subject to current events and what was happening in the news and in Philadelphia. This, I thought a wonderful way to lead students to observe and participate in their environment. The discussion ranged from politics through economics to science (the discovery of a comet). As each student commented on current events, Alexis coached their grammar, gently reminding them of correct structure when their's was a little off. They were also asked if they had any personal concerns or problems they wanted to address. The approach was exceptionally human and personal without being intrusive. With the discussion of current events as a kind of warm up, the topic turned to the order of the day. The class would engage in character interviews. The students were asked to decide on a character that they wanted to be. One group would be the interviewers, the other, the character interviewees. Then, the groups would be reversed. Questions such as: "How do you know so much about mathematics?" "Could you describe your father and the relationship you had with him?" "How do you feel about your sister, Clair?" all lead into thoughtful answers "in character". Such a process is revealing. On the one hand, it is freeing for students because they must use their imaginations as they speak and, from their interpretation of the characters and the play, fashion responses. It is not personal, there is no firm "right" or "wrong," so language flows more fluently. However, as it flows, there is the inevitable new vocabulary word that shows it's head and the grammar points that need to be gently corrected. Words such as "obsessed," mathematician," "breadwinner" need to be dealt with and explained. Grammar points, especially tenses, need continual attention as does structure: "Why you were" changes to "Why were you?" and so forth. But, the point is that these students are intent on communicating and the little imperfections in their language ability appear and are corrected in process. Their language needs are evoked, addressed immedeately, and continually reformed. The questions continue for almost two hours and are interesting and evocative all the time because they are based on feeling, motivation, and character. In the end, ALL students have a better understanding of all characters and the meanings of the play because they have examined it from the inside out. The next step is to form some small groups for further work with the play. For individual assignments, students will do oral readings - speeches from Proof and conduct outside interviews asking people what they think about some of the topics found in the play: sibling rivalry, fame at an early age, depression. In their groups, students have a writing assignment. That is: to create a final project, either a sequel to the play or a different ending. They are given outlines for the tasks involved. The following are Alexis's instructions. 1. Select a secretary and a discussion leader if you have more than three people in your group. 4. Write a plot outline. (Include a lit of characters, brief description of setting: time and place) Create a title for your original "play." 5. Divide the content of the plot into scenes. 6. Assign scenes for writing (dialogue and narration). 7. Group reading of scenes: check for continuity and equity (equal treatment) of dialogue for all characters. Make changes if necessary. 8. Group reading of final script: list suggestions for props, scenery, costumes, background music. Click below to travel on to Julie O'Sullivan's adult ESL class at Duchess County Community College in Poughkeepsie, New York. Julie co-authored with Ann F. Burke the magnificent, Stage by Stage: A Handbook for Using Drama in the Second Language Classroom. I'm really looking forward to this trip and a chance to view her work. You will be interested, too!